BYD duel mode engine Electric cars are being aggressively promoted by the Chinese government. In many ways they are well suited for China, where long distance travel is still rare and most people use their cars to make short city trips at low speed’so that a car will only a 100 or 200 kilometer range is not all that much of a set back. In 2010, the Chinese government began promoting eco cars in earnest by offering subsidies of around $8,000 for the purchase of electric cars, covering almost half of the $20,000 purchase price of such vehicles. The aim of the subsidies is to boost the local eco-car industry. The subsidies are generally available only for domestically-produced vehicles not foreign-produced ones. Obstacles in the way of widespread electric car use include the fact that more Chinese live in apartments than private homes, making it difficult to set up rechargers; the bad reputation that lithium-ion batteries have in China, where counterfeit ones in cell phones occasionally explode; and the high cost of electric vehicles, which are beyond the means of most Chinese who are better off with a small, fuel-efficient vehicles. Electric cars will probably have only a limited effect on cleaning up the air and reducing carbon emissions in that three quarters of China’s electricity---which will ultimately power these cars---comes from coal. A report by McKinsey Co estimated that by using electric cars over gasoline cars, China will reduce its greenhouse emissions by 19 percent. The switch could significantly reduce urban smog with clean vehicles in the city and the coal plants that produce electricity used to power them on the fringes of urban areas. China has tougher fuel-efficiency standard than the United States. A 12 percent tax has been imposed on gas guzzlers; reductions have been offered for cars with small engines. The moves have been prompted by high oil prices and energy shortages. Eco-friendly cars already in operation include the Habo No.1, a Volkswagen that employs rocket technology, runs on hydrogen peroxide, and emits only water. There are also hybrids and a wide variety of other vehicles with electric engines and fuels cells. China already has fuel cell buses and taxis in operations in Shanghai produced by Sheng-Li High Tech Co., a firm founded by a Clemson-University-trained engineer named Hu Liqing. Another company, Fuyuan Centru Fuel Cell, produces membranes for fuel cells---the most expensive part of a fuel cell---for Dupont which dominates the market for these components. The Chinese government has developed a plan to make China one of the leading producers of electric and hybrid vehicles by 2012. The goal meets two basic needs: 1) to improve the environment and save energy at home; and 2) make Chinese automakers major player in the global automobile industry. China has many things going in its quest of this goal: abundant cheap labor and a solid manufacturing base. One of its biggest shortcomings in the auto industry is its outdated gasoline engine technology. Making a move to electric cars in a big way could allow it to leapfrog the West. 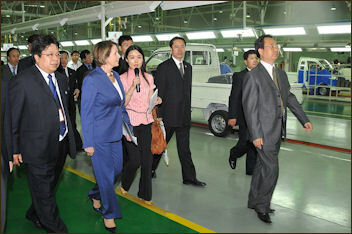 Tiangin-Qinggyuan introduced an all electric Saibao sedan in 2009 that sells for around $30,000. The battery alone makes up about half the cost the same vehicle with a gasoline engine cost around $14,500. Large scale production is expect to reduce the cost of the batteries and motor by 30 to 40 percent. 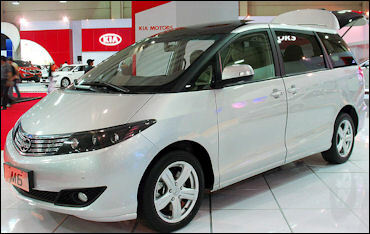 China hopes it manufacture 500,000 electric and hybrid cars and buses by 2011, up from 2,100 I 2008. To boost sales taxi fleets and local government are being offered subsidies of up to $8,500 for purchasing hybrid or electric vehicles. An electricity sedan produced by Lujo (Weihai) EV R&D Co. passed a series of European EEC regulations in May, 2010. This electric vehicle (Model: LUJO BB) is the first and the only one in China passed the EEC check with maximum speed 80km. Lujo is a government supported enterprise mainly engaged in manufacturing and assembling electric vehicles and its core parts in China. The company mainly cooperates with customers to convert a target car in China into electric version. The bold plan was announced in August 2010 by one of China most powerful bodies: the State-owned Assets Supervision and Administration Commission. Sasac, as it is known, operates under China cabinet, or State Council. From Beijing, it oversees about 125 of China biggest state-owned companies. State-owned companies have an overall advantage in developing the electric vehicle industry, Li Rongrong, Sasac chairman, said in a statement. Few details of the plan were released. But Beijing said that over the next three years, 500,000 energy-efficient vehicles would reach the market each year and that more-efficient vehicles would soon account for 5 percent of passenger car sales in China. In 2010, analysts expect vehicle sales in China to reach about 17 million. What you have here is the confluence of two important things, Professor Shenkar told the New York Times. The car industry was long ago designated as a pillar industry for China. And the second thing is green technology or high tech; this is where the action is going to be, and China wants to be there. There is some opposition to the plan. The English edition of The Global Times, another state newspaper, said on Thursday that some groups had criticized the alliance, saying it favored big state-owned companies and had not made clear who would own the intellectual property. The government said the country top state-owned oil producers, power companies, several military and aviation companies, and two of the nation biggest car companies, the China FAW Group and Dongfeng Auto, would be involved in the effort. Both of these companies have joint venture deals with foreign automakers, which have already spent millions of dollars developing electricity and hybrid technology, and is not clear how this will play out. Beijing is trying to generate demand by promising subsidies of 60,000 yuan ($9,200) per electric vehicle. Cities are being given grants to buy electric buses and taxis. Geely's two-seat McCar, Dongfeng's Shuaike microvan, the four-seat M1 REEV from Chery and others promise a range of more than 100 kilometers (60 miles). Most are still in development but some are appearing on China's streets. Evan Osnos wrote in The New Yorker, “The race to make the first successful electric car may hinge on what engineers call “the pack”---the intricate bundle of batteries that is the most temperamental equipment on board. If the pack is too big, the car will be too pricey; if the pack is too small, or of poor design, it will drive like a golf cart. “Batteries are a lot like people,” Phil Gow, Coda’s chief battery engineer, told me when I visited the Tianjin factory, a ninety-minute drive from Beijing. “They want to have a certain temperature range. They’re finicky.” At one of Lishen’s production lines, similar to the car-battery line that will be fully operational next year. Workers in blue uniforms and blue hairnets were moving in swift precision around long temperature-controlled assembly lines, sealed off from dust and contamination by glass walls. “A slogan on the wall declared “Variation Is the Biggest Enemy of Quality.” Gow nodded at it gravely. A bundle of batteries is only as good as its weakest cell; if a coating is five-millionths of a meter too thin or too thick, a car could be a lemon. The new plant will have up to three thousand workers on ten-hour shifts, twenty hours a day. “When you get down to it, you can have ten people working in China for the cost of one person in the U.S.,” Mark Atkeson, the head of Coda’s China operations, said. BYD was founded by Wang Chuanfu in 1995 when he was in his early 30s. Wang graduated from Central South University in 1987 and is an expert in materials science. 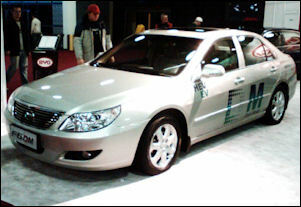 BYD went public on the Hong Kong exchange in 2002. Warren Buffett is among its investors. In September 2008, he purchased a 10 percent stake of the company for $230 million. BYD became the world’s leading small battery company in 2005 and is one of the world’s largest manufacturer of rechargeable batteries. Its batteries are found in cell phones, digital cameras, iPods, electric toothbrushes, vacuum cleaners and a host of other products. 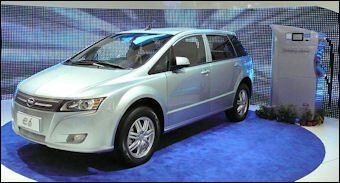 BYD is emerging as leader in the electric car sector. It has built a 1.6-million-square-foot assembly plant and has hired Italian-trained car designers to make plug-in hybrid car that can be charged using an electric outlet at home. The vehicle, the F3DM, can run for at least 100 kilometers on battery power alone, after which a gasoline engine kicks in. The vehicle is powered by an iron-based battery that can be fully recharged on a home socket in seven hours and is said to be able it be recharged over 1,000 times, a high number. When a drivers presses on the gas the car accelerates just like a gasoline-powered car, with enough punch to send the drive pushing back into the seat. The F3DM, a BYD plug-in hybrid, retails for about $20,000, about twice as much as Chinese-made sub-compact car. .
BYD hopes to have an electric car ready to sell in the United States in 2012. BYD has made a four-door, all-electric vehicle capable of traveling 300 kilometers on a single charge that can be charged at a charging station in around an hour or in a plug in outlet at home for a longer period of time. The car is capable of going from 0 to 100 kilometers per hour in 14 seconds. 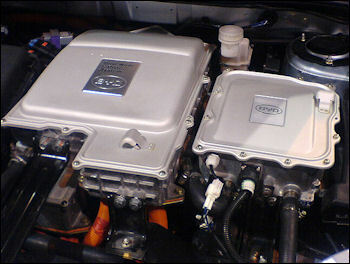 BYD employs 5,000 auto engineers and an equal number of battery engineers whose salary begins at around $600 a month. Assembly line workers are paid between $150 and $300 a month. The company makes most of its components itself, an advantage in the car industry. It has goal of being the largest car maker in China by 2015 and the largest in the world by 2025. BYD has been pushing more aggressively into clean technologies, from plug-in hybrids to energy storage facilities. In 2011 the company raised $219 million in an I.P.O. in Shenzhen to help finance battery research. BYD has said it is aiming to bring its “zero emission solutions” to solar collectors and energy storage. “Our vision is not just cars,” founder and CEO Wang Chuanfu told the press at a car show in Detroit. He spoke of the “three green dreams” of “affordable solar power, environmentally-friendly energy storage and electrified transportation powered by clean energy.” According to Wang’s vision solar power will collected from solar farms, solar-shade parking structures and home-mounted solar panels. The energy would then be stored in the company’s “Fe” batteries and used in used BYD’s K9 e-Buses and the e6 sedan. 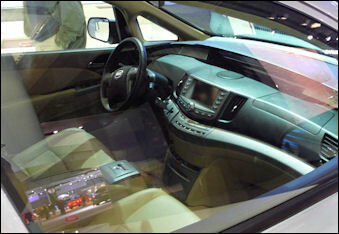 BYD F3 BYD unveiled it all-electric, five-seat e6 at the Beijing Auto Show in April 2010. It began testing 100 of them as taxis in Shenzhen in June and is hoping to sell the vehicle in the United States by the end of 2010, beginning first in the West Coast where interest in alternative vehicles is high. 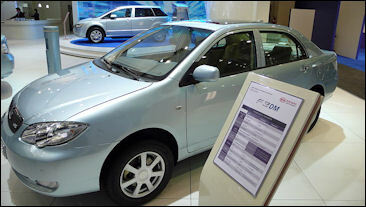 BYD has sold several hundred of the F3DM plug-in hybrids in China so far, more than any other domestic automaker, and its e6 is to be available in showrooms in Beijing and Shenzhen in the second half of 2011. BYD is testing its F3DM hybrid in Los Angeles and says it hopes to start U.S. sales of its K9 electric bus in 2012. BYD's e6 sedan, which promises a 190-mile (300-kilometer) range, has been tested in taxi fleets in the southern Chinese city of Shenzhen since 2010, BYD plans to deliver 250 more e6 cabs to Pengcheng by August 2010. It also plans to provide 200 of its electric buses to the Shenzhen public transportation system in 2011. Germany's Daimler AG, maker of Mercedes Benz cars, is creating a new electric car brand with BYD and plans to launch a model in 2013. Daimler's CEO for Northeast Asia, Ulrich Walker, said it went that route because it wants to create a separate, lower-cost brand, not because of government pressure. At the same time, BYD is developing its own vehicles. In the spring of 2008, Czinger signed on as the C.E.O. of Miles Electric Vehicles, a small electric-car company in Santa Monica that was looking to expand, and he went searching for a Chinese partner. He ended up at Tianjin Lishen Battery Joint-Stock Company. Lishen received millions in subsidies and hundreds of acres of low-cost land to build a factory. The company grew to two hundred and fifty million dollars in annual sales, with customers including Apple, Samsung, and Motorola. Last year, the 863 Program gave Lishen a $2.6-million grant to get into the electric-car business. That is when Czinger showed up. “We hit it off immediately,” Qin Xingcai, the general manager of Lishen, said. Czinger, who by now was heading up a sister company called Coda Automotive, added components from America and Germany and a chassis licensed from Japan. If all goes as planned, the Coda will become the first mass-produced all-electric sedan for sale in the United States next fall, with a price tag, after government rebates, of about thirty-two thousand dollars. The Coda looks normal to the point of banal, a Toyota-ish family car indistinguishable from anything you would find in a suburban cul-de-sac. And that’s the point; its tagline, “A model for the mainstream,” is a jab at more eccentric and expensive alternatives. BYD is using the pilot project to gather market feedback and make adjustments to the vehicles before rolling out the electric car nationwide. “We had anticipated a lot of problems early on, but that did not happen and the data we’ve collected are actually better than what we got in lab tests,” said Stella Li, senior vice president of BYD. “Taxis are definitely a smart way for people to gain the kind of practical hands-on, in-the-field experience, but it will be very closely watched,” said William Russo, an industry veteran who runs Synergistics, a consulting firm in Beijing. But for Du Jun, general manager of Pengcheng E-taxi, the operator participating in the pilot project, the project’s hurdles are apparent. The company is still sitting on a big loss for which Mr. Du blames hefty upfront investments, an insufficient number of charging spots and the limited distance that an electric vehicle can travel per charge.”“The electric car is still too expensive, and we ended up paying a lot more than for a Santana, even with government subsidies,” Du said. In Hangzhou, a similar green pilot program stumbled when all 30 of the city’s electric taxis, which appeared on the streets in late January, were pulled from service in April after one cab’s engine compartment caught fire. The fleet resumed operations in June. Jonathan Watts wrote in The Guardian, “Officials in Beijing have urged the auto industry to improve technology for years. Auto executives from domestic and foreign automakers alike have said they would do more to adopt advanced technologies, although domestic Chinese automakers tend to have modest research budgets and rely on multinational partners for their vehicle designs. Recently the government has shifted its tone in calling for curbs on the industry’s overall growth in sales and production. [Source: Jonathan Watts, The Guardian August 23, 2011] . 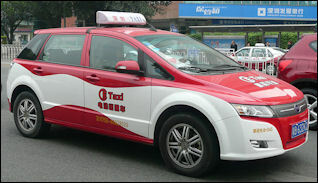 BYD have scaled back their ambitions after failing to find a market due to cost and technical concerns. Reflecting the lack of progress, prime minster Wen Jiabao recently published an article in a Communist party journal calling for a rethink of China's "road map" towards alternative powertrain vehicles. In a report earlier this week, IHS Automotive a Shanghai-based consultancy, said the sales increase for such vehicles is far behind the government's timeframe. It noted too the poor performance of the Prius, which notched up a sole sale in a year when 13.8m new passenger cars were registered in China. Among them were 850,000 SUVs, a rise of 24 percent.